Think and feel (preoccupations) See (environment) Say and do (behaviour) Hear (influences) Gain (wants, needs, success) Pain (fears, frustrations, obstacles) • What is important to them? • What really counts for them? • What keeps them up at night? • What are their worries and aspirations? • What does it look like? • Who surrounds her? • How do they access websites? • What are main forms of communication? • What do their colleagues say? • What does their boss say? • What other media or sources are influential? • What is their attitude in public? • What is their behaviour towards others? • What is their biggest pain? • What is their biggest frustration? • What obstacles are holding them back? • What do they gain? • What do they want to achieve? • How do they determine or measure success? • What strategies, shortcuts or workarounds might they use? Definition: Campaign (to support) A campaign supports a cause or several causes. It may also be used to advocate causes. A campaign is supported and promoted by partners but can sometimes just be set up by Theirworld. A campaign is supported by campaigners , which may include individual supporters, who may be members of the public. Campaign examples #upforschool Syrian rappers petition signing #safeschools Not to be confused with… A campaign is different from a movement because it has fixed goals, timings and can be ended. It is rigorously planned with actions in mind. Campaign flow Campaign Action Social media, email, word of mouth, home page, etc Cause Story (Voices post) Share Campaign Resources News article/ blog post Social media, email, word of mouth, home page, etc User Journeys v1.0 Richard Rutter, Clearleft Share Cause depends on subject Campaign flow Project A supporter clicks a link in their social media feed and lands on a Campaign page. They click to read a story on a GYA’s blog about the benefits of the campaign. The blog post directs them back to Campaign where they click the call-to-action. The supporter is directed to an Action page and completes the action (eg. signs a petition). They share the action on their social media. They are presented with further campaigning options (‘what to do next’) and directed towards campaign- specific Resources. A supporter clicks a link to a News article in their social media feed. They read the article and share it with their own social network. The news article is about a Project and, interested, they follow the link to the Project page for more information. They see the project has a campaign behind it and follow the link to the Campaign page. Page tables are essential writing briefs for any writer who is commissioned to write content. They can be designed to suit the project. ordinates the content writing process. Why is child marriage an important issue? Why is it a barrier to education? What shifts in the political landscape have there been? does the future look like? What can people do to support the cause? 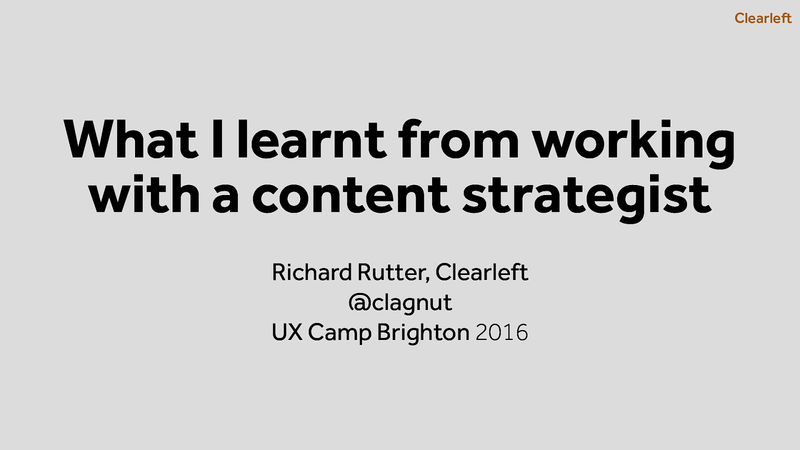 View What I learnt from working with a content strategist on Notist.